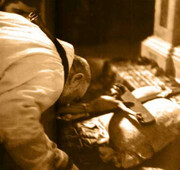 I wanted to share with you my favourite Padre Pio photos...I have begged, borrowed and shamelessly stolen them! I think my absolute favourite would be the first, (enjoying a laugh) and the seventh, (he is reading a letter with the three soldiers). 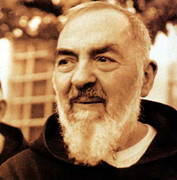 Incidently the very last photo portrays what was called "the look" of Padre Pio where he looked at you and seemed to gaze into your soul. Hope you enjoy them! Last edited by Gael on Mon Sep 15, 2008 9:41 pm, edited 1 time in total. I forgot to say if anyone has any more photos please feel free to add them to the thread. thanks gael,Padre Pio is so special he is so great!! also he looks so sweet ! like I want tu hug him! Thank you Gael for posting these magnificent photos; they are simply beautiful! One can see how Holy he is! Once I had gotten to know him for myself i.e. reading about him and watching his life story, I began praying to him while preparing to go to confession... It really makes a difference! Jesus, make our hearts like Yours! Gael, thank you so much. These photos are very special. I heard about him as a teenager in the Church where I grew up. There was a little booklet about him for sale. For some reason I didn't think to buy it. Perhaps it was about the time when I left the Church. I was fascinated by his stigmata. The miraculous really spoke to me as a teenager. But I didn't find out anything more about him. My parents didn't seem to have heard of him or perhaps they had but didn't know much. Anyway, I've learnt more about him on here and in links that forum friends have sent me than from anywhere else and I want to thank you all. Thank you so much, Gael. More great photos at this website below....if you go to page 4 there is the photo of a very young Private Francis Forgioni aka our own Padre who was conscripted into the army, but later allowed to return home due to ill health. just beautiful gael!!!! thank you so much for these wonderful pics of 'our' little padre! having loved him my whole life, it is a special gift to see photos of him which i've never seen before! thanks for bringing this special joy to the forum!! I haven't seen many of them before! How awesome! You have reminded me that I have to trust in him for intercession for me and my family. I'm so glad to be a spiritual child of his! Are we not so blessed as to have the awesome privilege of these wonderful and beautiful pictures of such a Saint? Received your letter today. I would be honored to have my photos published in the Franciscan Archive. I was a member of a choir organized by Father George Rice of the 463rd Bomb Group at the Celone airfield outside of Foggia, Italy. Twice we went to San Giovanni Rotondo to see Padre Pio. We sang the Mass of the Angels in Latin for Padre Pio as he celebrated Mass. After Mass we went into the sacristy where we were allowed to kiss Padre Pio’s hands and receive his special blessing. He took us into the Monastery and showed us his cell and gave us medals of the Holy Mother. Unfortunately I was involved in a roll-over accident a year ago, June, in which the wallet I had it in was lost. Also the medal I got from Pope Pius the 12th. Of the 12 or so members of our choir we only had one member get shot down in combat. He was also our soloist who sang the Ave Maria during the Mass. I have always felt God wanted him in his heavenly choir. He was blessed with a beautiful tenor voice. Enclosed are most of the pictures I have of our visits to San Giovanni Rotondo. I regret that I didn’t take more. Actually the first time we went there none of my photo’s turned out. The second time we went, I think in May of 1945, my photos were o.k.. Padre Pio allowed them. 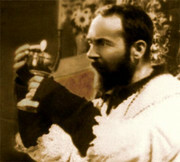 May God Bless you & Padre Pio bless you! P.S. I was a S/Sgt. in the Photo section of the 463rd Bomb Group. I was also a Public Relations photographer for that Group. I was also an aerial Photography and flew 22 missions. But was grounded because I was the only camera repair man in the Group. As he turns to say, “Dominus vobiscum”, the Stigmata on his hands are clearly visible. A view from the Choir Loft. To the left of the Altar, the Image of St. John the Baptist, the patron of the Capuchine Convent is clearly visibile. “Members of the 463rd Bomb-Group choir” enjoy some coffee at her “Pink Castle”. 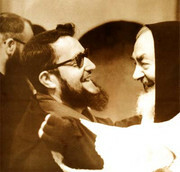 From “Left to rigt: the Count, Padre Pio’s Niece, Mary Pyle, Padre Pio’s Father, Padre Pio’s Niece”. I think the last two pics are my favourites, but I love the ones where he is laughing with his friends! Everyone always thinks the Padre was so serious and grumpy, he really had a great sense of humour! Last edited by Gael on Sat Jun 13, 2009 11:39 am, edited 1 time in total. Thanks LittleRed...glad you enjoyed them! thanks Gael these are awesome, yes Sharon I am trying to keep all the Padre Pio postings together too. Sharon, do you think at some point we could give Padre Pio his own thread/section on the forum so we could keep everything together? He is just so addicting, praying to him and with him and just love to look at him. We are all so lucky to have such a special saint with us! I missed this one too! 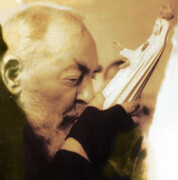 Thank you so much to Gael and all who posted such awesome photos of Padre Pio! National Shrine of St. Rita in Philadelphia, Pa.
~~Through All I say and All I do~~ Jesus, I Trust In You!